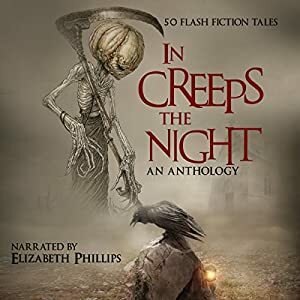 I was browsing through Amazon at the books in which I have stories and noticed the "cover" for In Creeps the Night didn't look quite right. The image seemed to be truncated and I couldn't figure out why. Then I realized it was the cover image of an audiobook! I didn't even know one was being developed. Now I can hear someone read my story, Little Monsters, back to me! There's ever a sample on the page you can listen to. One warning, however. The audio file for my Android phone is rather large at about 178 MB. Might have to bump up the limit on my data plan if I download a lot away from a wi-fi connection. When you play the audio (which seems to require headphones/earbuds), the words are highlighted as the narrator speaks. This could be useful in teaching reading. And the inflection isn't always the same as when I read it, but most of the time it's pretty close. Everyone has a different little voice in their head. I have several, but don't tell anyone. Here's a screen shot of the audiobook page on Amazon (US). You can see the button for the sample audio playback. They don't list the authors on here, however. Unfortunately, Amazon has a limit on the number of authors it lists even on their book web pages, but I am in the book! Now I have something new to play with—and it includes one of my stories!